Waimea Town Market, located at Parker School. The Town Market, located on the Parker School Campus in central Waimea, though only a couple of years old, is already a lively gathering place for area residents and visitors. While there, we ran into people we knew from Hilo and Waikoloa shopping for produce and munching on yummy fresh foods. The vendors’ tents surround a grassy central square dotted with a few picnic tables where shoppers sit and enjoy their just-purchased snacks, do some people-watching or just rest a while. A DJ provided a wide variety of music. Visitors might want to mark their calendars for the market’s regular holiday events, such as a major party for July 4th; a giant pumpkin contest, dog costume contest and booth decorations for Halloween: bell ringers and carolers at Christmas; the town’s Cherry Blossom Festival; a lei competition on Lei Day (May 1st), and other special events throughout the year. Eva Lee and Chiu Leong of Tea Hawaii & Co. The first booth we found was that of Tea Hawaii & Co., owned by dancer-choreographer turned tea farmer Eva Lee and her husband, renowned potter and photographer Chiu Leong of Volcano Village. Eva and Chiu were assisted by his daughter, Asia, in explaining and answering questions about their tea. The booth provided samples of their tea, and also delicious little confections made with Okinawan purple sweet potatoes, sour cream and black tea syrup in the shape of a little round fruit with a small tea leaf sprig at the stem end. This delicious morsel was served on a larger tea leaf. Although in business since 2006 at their 4,000 foot elevation tea farm in Volcano, Eva and Chiu are fairly new to the Waimea Town Market. Even though the 4 hour weekly round trip is a long one, they report the trip and their booth at the market are both fun and profitable. The couple cultivate Camellia sinensis tea plants; sell tea, tea plants, value-added tea products and practice some of the arts that accompany the tea tradition, such as pottery handmade by Chiu. 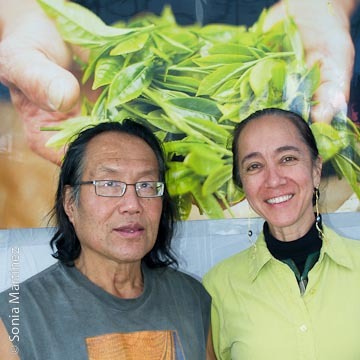 Eva and Chiu, through Tea Hawaii & Co. and the participation of other Hawai’i tea growers that they represent, along with assistance in part by the County of Hawai’i Office of Research & Development, hope to encourage more sustainable tea growing activity on the Island of Hawai’i. Paul Johnston, Betsy Sanderson and Esko Dakamas at Kekela Farms booth. Paul Johnston, his sister-in-law Betsy Sanderson and Esko Dakamas were found busily waiting on a long line of customers at their Kekela Farms booth. Several long tables were piled with a beautiful collection of vegetables: celery, assortments of beets in different colors, several varieties of large and mini eggplant, carrots, a large assortment of greens, radishes, cabbage, kohlrabi, broccoli -- and much more. Kekela Farms has been in business for the last 8 years and is located at the 3000 foot elevation on Mana Road in Waimea, where they grow 30 different vegetables in over 100 varieties. Although they follow the rules of the National Organic Act and use many sustainable farming practices, they have chosen to not be Certified Organic. 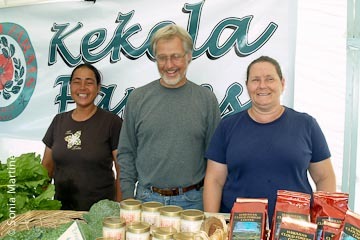 Kekela Farms also sells products for other purveyors such as coffee, honey, fruit, goat cheese and Kona gold vanilla beans. The booth provides each shopper with a basket which can be filled with all the selected goodies and then go to ‘check out’. 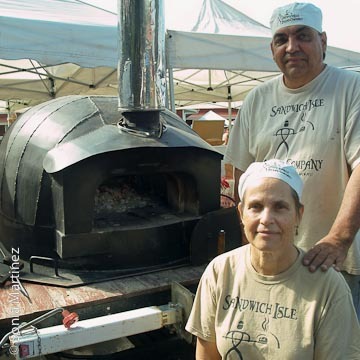 Kay and Kevin Cabreras of Sandwich Isles Bread Company with Matilda, their traveling brick oven. Do you ever expect to see a bread brick oven at a farmers market? I didn’t, and was surprised to meet itinerant bakers Kay and Kevin Cabreras, of Sandwich Isles Bread Company, who introduced me to ‘Matilda’, their traveling brick oven on wheels. The Cabreras have been participating in this market since the market first opened in September of 2008. Here, they make and sell their huge selection of artisan style breads and pastries made in their wood-fired mobile oven. Kay and Kevin told me with no hesitation their two best sellers: Pane Pugliese (Italian style sourdough) and Pain Au Levain (naturally leavened French style sourdough). But we decided to bring home a loaf of their 20-seed sourdough for sandwiches, and a brioche to be eaten at breakfast the next day -- and were delighted with our selections. We then found delicious home smoked-cured bacon at the Mai Bacon tent run by Chef Allen Hess and Eddeenrose Jara. Named after their daughter Mai, the bacon is their only product, sold and packaged in slabs or sliced and cooked as part of a towering delicious BLT sandwich. All the components of these sandwiches are locally made or grown: the buns, the lettuce, the tomatoes and of course, the bacon. Mai Bacon tent with Chef Allen Hess. 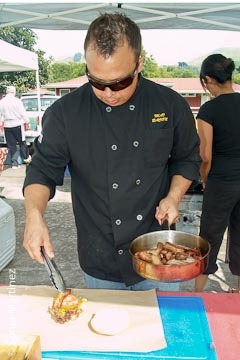 Chef Allen, who has been participating in this market for the last 9 months, is Executive Chef at Merriman’s in Waimea and learned to cure his own bacon about a year ago. Trying to keep it local, Chef Allen uses peppercorns, cloves, nutmeg and mace grown in Papaikou, on this island for curing his bacon. Chef Allen was one of 4 people selected from this island to represent Slow Food Hawai’i at this years’ Terra Madre 2010 meeting in Torino, Italy on the third week of October. Terra Madre is an international conference that gathers sustainable food producers, farmers, cooks, educators and activists from around the world to connect and share their stories and traditions, as well as their innovative solutions for keeping small-scale agriculture and sustainable food production alive and well. Delegates come from over 150 countries. We congratulate Chef Allen Hess for being chosen as a representative of our island to this conference. An unusual and exciting mix of vendors can be found at this market. We recommend taking your time and talking to these and the other growers, farmers and producers who sell their products here, and learning more about where and how their food products are grown. If you don’t live nearby, try to at least visit once every few months. Cost per stall/booth: $20/week plus $10 per month, plus GE tax. The $20/week goes to Parker School for its academic programs – we are a volunteer market and the organizers and Steering Committee are not paid. The $10 per month goes to promotional events. b. Diversity of products: Good growth, especially in the eat-at-the market food vendors, tea, coffee and prepared food. c. Increase in income: Parker received $2000 for 3-plus months in 2008, $14000 in 2009, and will end up with at least $20,000 this year. Geographical range of vendors: Most are local (Waikoloa to Honoka’a,– but three are from Hilo, one from Captain Cook, one from Kona and one from Volcano. Other special features: We have live music almost every Saturday. We hold annual entertaining events for the major holidays. We hold occasional other events (chef demonstrations and hands-on pottery sculpture, for example). This year we had a vendor pizza party with pizzas from the wood-fired oven, salads and other food, and that event will become an annual feature – a great way to get to know the other vendors.